In the olden days, reaching level 99 in Diablo II was a pretty big challenge, but even though it's easier to level up in Diablo III, getting to paragon level 1000 is just insane. But one dedicated guy, Gabynator, did it way before anyone else. He managed it with his guildmates, who opened up Malthael boss runs for him on the hardest difficulty, so he could just join in, get the XP, and get out. Also, they ran rifts on the hardest difficulty as well, which is probably the most efficient way to gain XP right now. And this is what the rest of the ladder looks like, according to Diabloprogress. These other players are not even close. And it's not over. 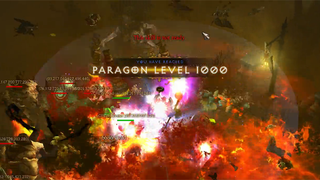 Paragon levels in Diablo III are infinite. Since there's no cap, he can just grind further—although going from 1000 to 1001 will take as much experience points as the first 244 levels combined.